The devil can do nothing in the life of the Christian without God’s permission. What a perfect description of Satan—just roaming about like a lion, checking everything out, looking for prey. Then God said, “Have you considered My servant Job, that there is none like him on the earth, a blameless and upright man, one who fears God and shuns evil?” (verse 8). The devil wanted to attack Job, but he recognized there was protection around God’s servant. And there is protection around us as well. When the devil comes our way, he has to first get permission from God. He cannot just run through our lives willy-nilly. And know this: Whatever God allows in your life, He allows for a purpose. Sometimes we wonder why the Lord allows tragedies in our lives. While we can’t answer that, what we do know is this: God will never give us more than we can handle. And when we are tempted, there is always a way out. The word revelation means “unveiling.” It is not God’s desire to conceal but to reveal. What does God have to reveal to us about the end times? 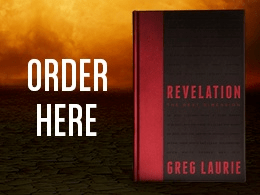 Find out with Pastor Greg’s newest book, Revelation: The Next Dimension. Revelation: The Next Dimension will be sent to you in thanks for your gift of support to Harvest Ministries this month.